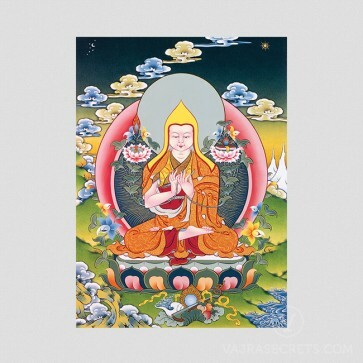 A canvas printed thangka of Lama Tsongkhapa, depicted as a youthful 16-year old. A canvas printed thangka of Lama Tsongkhapa. Lama Tsongkhapa grants wealth, business and career to the practical minded. He thus allows us to look deeper into spirituality with minds freer of mundane matters. Having an image of Lama Tsongkhapa harmonizes the energy in the home and stabilizes our wealth and happiness. Essentials of food, money, shelter and clothing will cease to be a problem. Wearing this pendant invokes the blessings of Lama Tsongkhapa and has a calming effect on aggressive minds and destructive emotions.